Whistleblower and ex-NSA employee Edward Snowden has criticized a new anti-terror law introduced on Thursday by Russian President Vladimir Putin, referring it as "repressive" and noting that it is a "dark day for Russia." The new legislation signed by Putin would compel the country’s telephone carriers and Internet providers to record and store the private communications of each and every one of their customers for six months – and turn them over to the government if requested. The data collected on customers would include phone calls, text messages, photographs, and Internet activities that would be stored for six months, and "metadata" would be stored up to 3 years. Moreover, Instant messaging services that make use of encryption, including WhatsApp, Telegram, and Viber, could face heavy fines of thousands of pounds if these services continue to operate in Russia without handing over their encryption keys to the government. "Putin has signed a repressive new law that violates not only human rights but common sense. 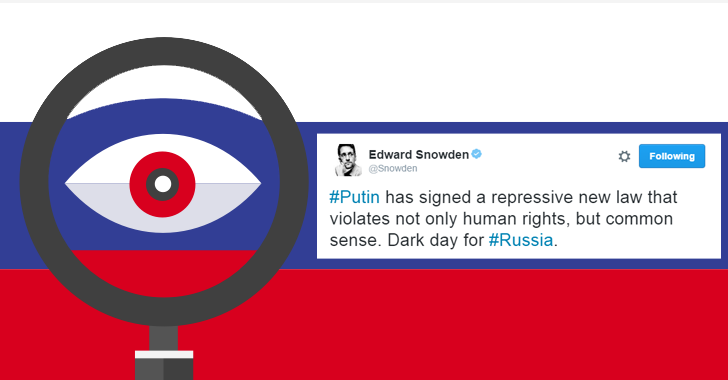 A dark day for Russia," Snowden wrote on Twitter. Snowden is responsible for revealing global mass surveillance programs by leaking NSA classified documents back in June 2013 before finding asylum in Russia. The activist explained that the new Russian law, in addition to "political and constitutional consequences," would cost telecommunications providers over $30 Billion to implement the new law, which is more than they can afford. The CEO of Russia’s second-largest telecom company Megafon told a local newspaper Thursday that he would rather pay the government higher taxes than spend over $3 Billion yearly on infrastructure upgrades. "Well be unable to fulfill the requirements of law in the way that it exists at present," said Megafon CEO Sergey Soldatenkov, adding that his company only generates an annual profit of $780 Million. "When we saw the provisions of the bill, we really hoped that it will not be accepted. I believe we have done everything possible to inform deputies, Federation Council [and] the government that the bill in this form is impossible," Soldatenkov added. A spokesperson for Tele2, another Russian telecom company, said it might have to raise prices threefold or more in order to accommodate the new law, The WSJ reported. The Russian government will establish the precise requirements of the new legislation, according to the Kremlin website. This frightening new legislation comes into force on July 20th.